Bottom Row - Left to right: Brothers Burton, Rainer, Wesley Sandle, Mullen, Luster and Boone. History according to "Tents and Tabernacles"
If different locations and distinctive names were considered as a unit Felder's Campground would be the oldest of all of the Methodist camp grounds in Mississippi, since it is one of a series of camp meetings at different places and under different names but all carried on mainly by the same families and their descendants. About 1810 or 1811 a camp meeting was held about one mile east of the present town of Magnolia by members of pioneer families from the older States; just how long this primitive camp meeting continued we do not know. Rev. Isaac Quin was pastor in 1810 and Rev. Hezekiah Shaw was pastor in 1811. About 1822 a new camp ground was established on the Bogue Chitto River, probably Just north of Quin's Bridge on the east side of the stream. Rev. William Winanas, who was presiding elder of the district, records in his journal that Colonel Gatlin was building a camp ground, which was known as Gatlins's Camp Ground. William Conerly, member of a well-known Pike county family, was converted there in 1826. How many years this camp ground remained in active use we cannot say. In 1842 or 1843 the following gentlemen joined in the establishment of a camp ground, the location of whick was apparently on the site of Gatlin's Camp Ground: John Felder, Matthew McEwen, Archie McEwen, Christian Hoover, Silas Catchings, Hardy Thompson, David Winborne, and Samuel Whitworth. The location of the camp ground was on Bogue Chitto River and in the absence of any contrary evidence we shall assume that the former site was used, which may be recognized still as an ideal spot. John Felder, whose name appears at the head of the list, was born in South Carolina, May 8, 1793, a son of Peter Felder, and came to Mississippi in 1810. He was converted at the first camp meeting held near Magnolia in 1811 and to the end of his life he was related to the Methodist Church and an active suporter of camp meetings. He moved to Topisaw Creek in 1839; he was married three times, first to Miss Elizabeth Sandell, second to Mrs. Simmons, and third to Mrs. Stanfill, and was the father of eight children, many of whose descendants still attend Felder's camp meetings. He died on December 20, 1875, and, appropriatly enough, his funeral sermon was preached at Topisaw by Pres. Harvey F. Johnson of Whitworth College. Matthew and Archie McEwen were brothers who came from the Carolinas early in the century and settled on Topisaw Creek. They have numerous descendants in this area. Judge Christian Hoover, whose wife was Mary Newland Nails, settled in Pike County in 1823 and was probate judge, representative, and senator from the county. Silas Catching was a son of Joseph Catching and Mary Holliday Catching, who came from Georgia and settled on the Bogue Chitto, Two Miles below Holmesville, in 1812. Mrs. Silas Catching was Ann Drake befor her marriage. Hardy Thompson was a memeber of a well-known Methodist family. David Windborne was the father of J. Harvey Winborne, local Methodist preacher and one of the founders of the Magnolia church. Samuel Whitworth was evidently a relative of Rev. Milton J. Whitworth, founder of Whitworth College, since the latter was converted at the camp meeting on Bogue Chitto River in 1842. There were, of course, many others than these, who had a part in the establishment and continuance of the camp meeting. One interesting fact about this camp ground was its change of name from time to time. The original camp ground on Bogue Chitto was called Galtlin's camp ground; just what it was called when re-establishmed in 1842 or 1843 we do not know. In 1845 it was moved to its present location on Topisaw Creek and was called sometimes by the name of the stream and sometimes by the name of the Felder family. Practically all records in early days refer to it as Otopasa camp meeting, this being the name of an Indian tribe from which the creek took its name. Fifteen years after its removal to the banks of Topisaw Creek the camp ground fell victim to the dark shadows of war and for twenty or more years no camp meetings were held. During that period camp meetings were held at Brookhaven, Magnolia, and McComb for a single year but in neither case did they become permanent. In 1881, under the leadership of Rev. John Wesely Sandell, who had joined the Felder church at a camp meeting in 1855, the people rebuilt the camp ground and since that time it has continued actively and usufully its honored history. In its post-war history it was usually called Topisaw Camp Ground, sometimes Felder's, and since 1940 it has been known officially as Felder's Camp Ground. "At the Otoposa Camp Meeting on Pearl River circuit we had a time of spiritual joy and holy triumph. God was with his people of a truth. Including some reclamations about forty were converted, ten or twelve professed to be cleansed from all sin and to be filled with all the fullness of God. Thirty-five whites and eighteen colored members were admitted on trial." Henry M. Youngblood was pastor with David Watson as his assistant in 1856. The process of rebuilding after the war was slow and when the opening night of the first camp meeting came after it was revived, it was necessary to postpone the opening servie until the tabernacle could be completed. 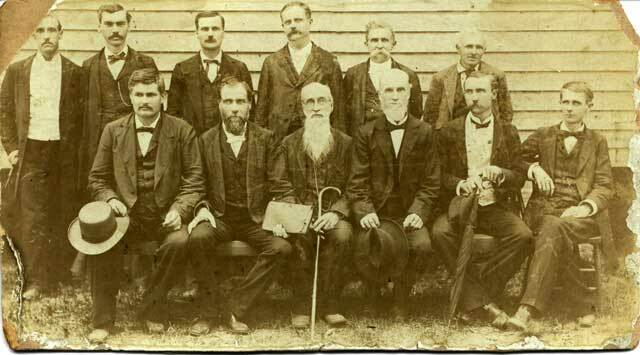 By the next year, 1882, everything was in order and the camp meeting began on Friday before the second Sunday in August. This was a notable year in the history of the revived camp ground. The Brookhaven District Conference was held during the camp meeting, Rev. John A.B. jones, presiding elder, in the chair. Nearly all of the pastors in the district were present and a number of visting laymen. There were fifty conversions and forty-six additions to the church during this campmeeting.